Thursday not only brought nine new polls from nine states, but broke from the "all blue" poll day on Wednesday. Overall, there was a mixed bag of results across the states represented. The Grand Canyon state just never established itself as the toss up state that some thought it would be in 2012. And that is completely understandable given the fact that things have swung back toward the Republicans after 2008. That national swing was equivalent to or slightly less than the combined impact of the Republican advantage in the state and the home state effect McCain had in Arizona four years ago. The truth of the matter is that Arizona looks now just about as it did then and the new Rasmussen poll reflects that. The new Q poll in the Nutmeg state is pretty much par for the course. After having narrowed to the single digits in a handful of July and August polls, the margin in Connecticut polling has been consistently in the lower double digits. That is true again in this poll. After a narrow win in Indiana in 2008, Obama and the Democrats have seen a significant shift/correction there in the time since. The movement in the Hoosier state has been among the largest of any state since the last election and has the state firmly stationed at or around the current Strong/Lean line on the Romney side of the partisan line. Like Arizona above, Indiana is red and not going anywhere. In Iowa, things remain competitive. The new poll from The Iowa Republican finds Romney in the lead by a point and is largely consistent -- at least in the toplines -- to the only other post-convention poll to find the governor ahead in the Hawkeye state from Rasmussen. Those two polls stand in contrast to the two-thirds of post-convention Iowa surveys showing Obama ahead by five or more points. That balance has pushed Iowa away from the partisan line deeper into the Toss Up Obama category (see Electoral College Spectrum below), but certainly not out of reach for the Romney campaign. Things are similar in Nevada . There is some polling variability in the Silver state, but one thing is clear there, post-convention: Obama is ahead. In all seven polls conducted since convention season closed, Obama has held an unweighted advantage of about 4.3 points. That isn't all that far from the overall FHQ weighted average for all 2012 polls there. By comparison, this Marist poll slightly underperforms those metrics, but is well within the range of results seen there. The major issue in the race in Nevada is that Obama has not trailed in any poll since a January Global Strategy Group survey. If Nevada is truly in play, Romney's share of support is going to have to show some signs of improvement sooner rather than later. With the caveat that Romney has actually led some recent polls in New Hampshire, the Granite state looks an awful lot like Nevada: in range for Romney but resistant for the most part in the polling conducted there. That said, this Marist poll is a bit rosy from the Obama vantage point. The unweighted, post-convention average level of support has the race at 47-44 in the president's favor. This poll, then, overstates Obama's position while nailing Romney's, which means that either this is just statistical noise or Obama brought home some "should" Democratic votes and/or undecideds coming out of convention season. It is not an uncommon pattern as compared to the trajectory of movement in some other states. FHQ has cast North Carolina as a leverage state for Obama in most of the discussions surrounding newly released polls in the state. That is one side of the story -- that Obama forcing Romney to use resources in the Tar Heel state means those resources are not spent in other competitive states -- but the other side is the overall consistency of the Romney lead there. Now sure, there has been some volatility in North Carolina polling. And that has recently given way to a series of polls showing Obama ahead there -- including in this Marist poll -- but that should not push us too far from the overall context. Both candidates are currently holding down positions in the mid- to upper 40s. That it continues to be close in North Carolina is a function comparing the proximity of the candidates to our expectations of where the race "should" be there. North Carolina has not swung back toward the Republicans in 2012 in the way that other close 2008 states like Indiana and Missouri have. There were a few post-convention blips showing Obama ahead by more than 5 points in Virginia, but that has quickly reverted to the pre-convention 2-4 point level of advantage the president held there. The Old Dominion really has been one of the clear examples of a convention bounce that has begun to dissipate and this Suffolk poll lends some credence to that conclusion. There isn't all that much to get too worked up over in Washington. The outlook has been consistently in Obama's favor in the Evergreen state, and it really does not look as if that is going to change in any meaningful way. Washington is a blue state. Enough said. 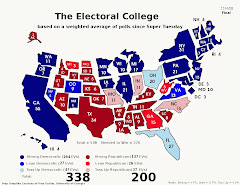 Consistency is still the word when it comes to the electoral college map above. There have been some shifts here and there, but the bottom line has remained the same in terms of the overall electoral vote tally. The majority of toss up states continue to tip toward the president and that has the count comfortably to his advantage. On the Spectrum, the newly added data did little to shake things up. 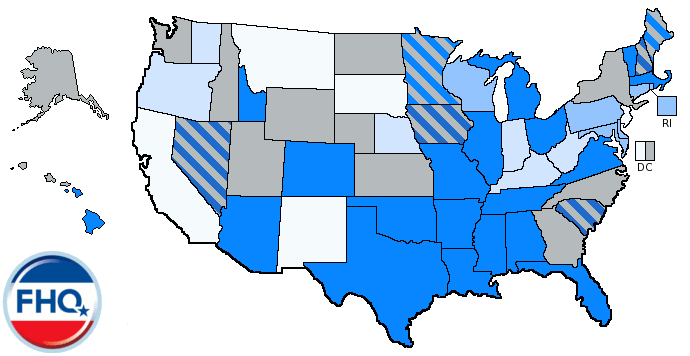 Arizona jumped deeper into the Lean Romney category, Indiana and Montana switch positions, and of greater import perhaps, Iowa and Virginia flip-flopped spots again today. In the case of Iowa and Virginia, the shift is important but does not change the fact that Romney is likely to need both, regardless of position, to get to 270. The Watch List has several new members today. Indiana, New Hampshire and North Carolina jump back on after having left the list at various points throughout the summer. The Indiana movement is less noteworthy than it is clerical. It is a red state. 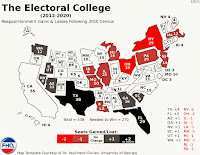 That New Hampshire is trending away from Romney and that North Carolina has slipped back onto the list are important in terms of the electoral college map. 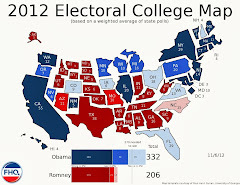 Those 19 electoral votes are important for a host of reasons to both campaigns. If New Hampshire is off the board, that is just as much of a problem for Romney as North Carolina being on the board for Obama at this point (even if Romney has consistently held the advantage there). Outside of the additions to the list, there is no other change to note in terms of category shifts. None of the new polls pushed any of the nine states into a new category. 1 The Watch list shows those states in the FHQ Weighted Average within a fraction of a point of changing categories. The List is not a trend analysis. It indicates which states are straddling the line between categories and which states are most likely to shift given the introduction of new polling data. Nevada, for example, is close to being a Lean Obama state, but the trajectory of the polling there has been moving the state away from that lean distinction.